These four cards were sent by Dan of Victoria, Minnesota. Dan actually sent these way back in April, but I'm just getting to them now. Sorry Dan. 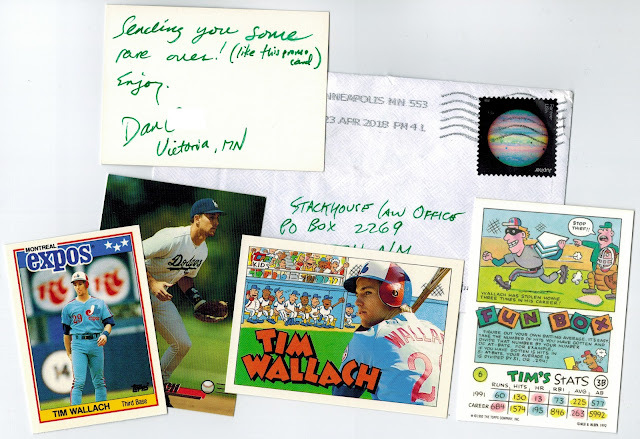 The 1992 Topps Kids Wallach is a card that has really grown on me over the years. I'm not sure I've ever seen any other cards from the set, but if they're all as nice as the Wallach, it's one I may try to complete at some point down the road. Thanks for the cards Dan.